Running a digital marketing campaign can be simultaneously one of the most frustrating and most fulfilling things a business owner can do. You’re putting your product or service, and your way of thinking about it, on the line – just hoping someone will acknowledge your hard work by clicking, filling out a form, or making a purchase. You’ve done all the legwork to make it happen and leads are starting to convert, but your analytics show that they’re hitting a wall near the end of your funnel. Could it be that you need a Thank You page to amplify the success your landing page is generating? If you never considered a Thank You page for your site, you’re not alone. Plenty of forms, pop-ups and even check-out pages lack the closure that a Thank You page can give your visitor. Expressing genuine gratitude. Everyone deserves to be thanked after they’ve done what you’ve asked of them. It’s just good manners. Providing instructions. If there is more to your transaction, like clicking a link in a follow-up email or going to a different part of the site, the Thank You page is the ideal place to outline what comes next. Giving closure to the transaction. When you fill out a form and nothing happens, do you worry that it didn’t actually work? So do your customers. A Thank You page gives them some closure. 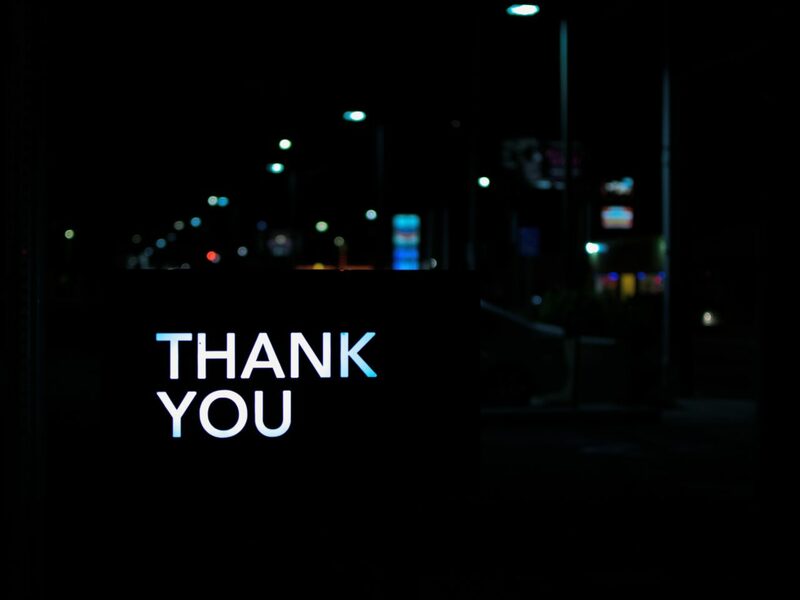 Having a Thank You page following actions that visitors perform isn’t a necessity, but if you want more and better conversions, it’s certainly something you should consider adding. They don’t need to be complicated, they just need to be present. Thank the Customer. This is a Thank You page, after all. Thank the customer for whatever they did to trigger that page. Something simple like “Thank you for requesting additional information” or “We appreciate your business. You can track your order using our sales portal located here” will be more than sufficient. Include a Time Frame. Whether extracting data from your site visitors or selling them the latest widget, give them all the details on the Thank You page. “We will return your email within 24 hours,” or “You can expect your order to arrive within 10 business days” will ensure that site visitors have expectations equal to your ability to fulfill them. Let Them Navigate. Don’t forget to include a navigable menu. There’s absolutely nothing worse than leaving your potential leads or confirmed customers stranded on a page. Sure, they can back out or type in a new URL, but if you give them more options within your site to visit, you may find they become more engaged with your brand. Using your Thank You page to suggest pages to visit based on the action they took to reach it keeps that visitor wandering your site. Ready to Become Friends? Your social media presence is hopping, but you can always use more friends. Make sure that links to your social media pages are included on the Thank You Page so that your new biggest fans can join the adoring throngs. Say Cheese! Even the most basic Thank You page should include a photo of you, your team or another human. Remember, this page is thanking someone for completing an action you requested. In real life, you’d be standing there saying “Thanks, my friend. Good job!” Be there in the digital world, too. You can find all kinds of advice online about how to build the perfect Thank You page, but these basic elements cannot be underestimated. When your site visitors feel like they’re truly appreciated and even better, by a real person, you can count on better and easier conversions. This may be the last section, but it’s far from least when it comes to a successful Thank You page. Your customer has completed their task and they’re getting distracted again. You have two options: engage them further or let them go, but give them a reason to return. Of course, you’ll have to make that call depending on what it was you thanked them for. For example, buying a jacket and paying with PayPal might trigger a coupon that brings them back later to use it before it expires. If they signed up for a whitepaper or other kind of downloadable content, a sample of other papers on similar topics might be just what the doctor ordered. You might even drive a downloader to an upcoming live webinar sign-up form. There’s little on your site that can cement your relationship with your visitors like your Thank You pages. And that’s really what’s at the root of conversions – they’re all about forming new relationships. Thank your visitors, they will notice. And thank you for reading to the end of this blog.